Best 8 of 18 - Worpel Coming in at number 6 is James Worpel with his incredible dodge against Selwood in a showdown against the Cats. Jarryd Roughead was the 49th captain of Hawthorn. 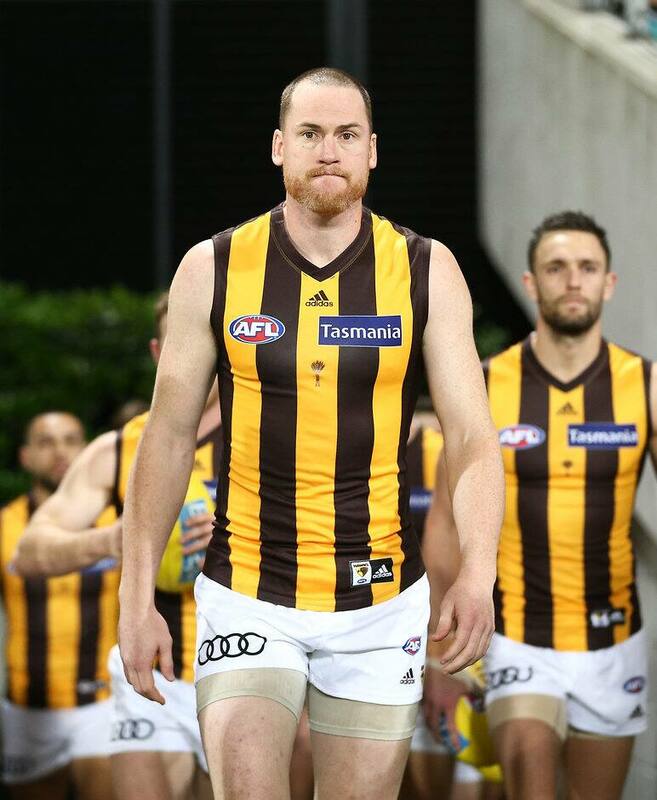 Jarryd Roughead was the 49th captain of Hawthorn since it was first formed in 1902 and competed in the Metropolitan Junior Football Association. He was the 35th appointed leader since the Hawks joined the VFL in 1925. Stuart Taylor was the club’s first captain in its inaugural year in 1902. Remembered as a strong, robust ruckman, the Taylor name has become one associated with the club for four generations. Jim Jackson was the captain for Hawthorn in their first year in the VFL in 1925. He captained for a total of four years between 1921-26 and later coached Hawthorn in 1932. Graham Arthur has held the longest reign of captaincy, leading for a total of nine years from 1960 until 1968. Luke Hodge, Shane Crawford and Michael Tuck all follow this record with six years in the position. Whilst Don Scott, Leigh Matthews, David Parkin held office for five years each. 13 of the last 15 Hawthorn captains have played in a premiership winning side. In terms of premierships won as captain, similar names again emerge with Tuck winning four, Hodge three, Scott two and Sam Mitchell, Matthews, Parkin and Arthur all claiming one each as well. Jason Dunstall leads the race by a long way when it comes to Hawthorn captains who have kicked the most VFL/AFL goals. Dunstall’s 1254 goals far exceeds second place, Lethal Leigh’s 915. Whilst Roughy has a little ground to make up as well, having slotted 491. Graham Arthur holds the mantle for most games played as captain, leading his team out on 153 occasions. He is closely followed by a star-studded peloton: Tuck (138 games), Scott (124), Crawford (118), Hodge (113) and Matthews (112). Crawford is the only Hawthorn captain to have won multiple Best and Fairest awards as captain, winning three in 1999, 2002 and 2003. Ted Fletcher (1953), Arthur (1962), Matthews (1982) and Mitchell (2009) are the only others to have achieved this double feat. Albert Mills, the Hawthorn Team of the Century back pocket, had an interesting run of luck through his intermittent years of captaincy. He captained the club in 1932, 1934, 1938, 1940 and 1941. But despite winning three Best and Fairest awards, none of these ever coincided with a year he was captain, winning the award in 1933, 1935 and 1939. Of the 23 members of Hawthorn’s Team of the Century (including the coach), 10 were captains of the club (Gary Ayres, Albert Mills, Jim Bohan, Graham Arthur, Jason Dunstall, Don Scott, Michael Tuck, Leigh Matthews, Chris Langford and John Kennedy Snr). Shane Crawford is the only captain in club history to have won a Brownlow whilst being captain. Sam Mitchell also won it in 2012, after relinquishing his captaincy at the end of 2010. Roughead endured the second longest period between starting at the club and then being nominated captain of any other captain of Hawthorn. Only Michael Tuck (arrived in 1972 and announced Captain in 1986) and Gary Ayres (arrived in 1978 and announced captain in 1992) had a longer wait. Both Tuck and Ayres were awarded the captaincy in their 15thseason, whilst the moment arrived at the beginning of Roughead’s 13th year. Dan Minogue came to Hawthorn in 1926. After stints with Collingwood and Richmond, given his glowing reputation, Minogue was instantly installed as captain. Yet his career with Hawthorn was short-lived, as he only played one game for the club as his first game saw the captain suffer a career-ending injury. Bill Walton captained Hawthorn in 1923 and 1924 after being recruited from VFA rivals, Port Melbourne. In a bizarre circumstance, Walton coached Hawthorn in a final, their first and only final whilst playing in the VFA, while still playing for the opposition, Port Melbourne. This came about after he was appointed Hawthorn coach but failed to get clearance from Port Melbourne, and remains surely one of the most unusual tales in football history. Albert Chadwick captained Hawthorn in 1929. Subsequent to his successful football career, which saw him finish second to Edward “Carji” Greeves in the inaugural Brownlow Medal in 1924, Chadwick was knighted in 1974, after serving 26 years in the Royal Australian Air Force. John Peck was captain in 1965, the year of Hawthorn’s most recent wooden spoon. That year Peck also won the Coleman Medal, which makes him and Brendan Fevola the only two players ever to have won a Coleman Medal and a wooden spoon in the same year. Fevola’s up-and-down year was in 2006, when Carlton won a second consecutive wooden spoon under coach Denis Pagan.